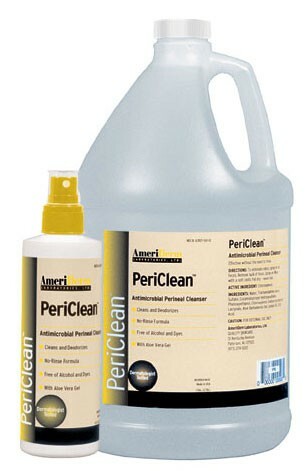 Periclean Antimicrobial Skin Cleansers, manufactured by Ameriderm Laboratories, are gentle, no-rinse cleansers that are ideal for use at hospitals, care facilities or at home. This Periclean cleanser is an all-in-one cleanser and skin treatment. This skin cleanser is conveniently packaged in an easy to use spray-on treatment. The gentle formula is dermatologist tested, so this Skin Cleanser is both gentle and effective. Periclean Antimicrobial cleansers contain a vitamin enriched formula that is ideal for soothing skin. These Incontinence Cleansers come packaged in a convenient spray bottle or gallon bottles. These perineal cleansers feature antimicrobial action, so that they are ideal for cleaning feces and urine. Periclean skin cleansers are enriched with skin soothing aloe vera gel. 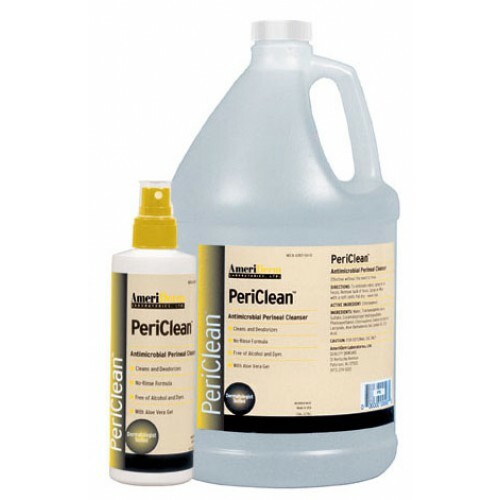 Periclean skin cleansers are colorless and odorless, so there are no irritating dies or odors. These no-rinse perineal cleansers are completely water soluble, so they should not stain clothing or sheets.